The working range of the tool has a diameter of about 80 meters with the Bosch LR 2 Professional Receiver. The receiver indicates both with light emitting diodes and also acoustically when the laser beam makes contact with it. There are two accuracy levels: leveling accurate to within three millimeters is done in seconds. If higher precision is required, the receiver does not respond until the result is accurate to within one millimeter. The robust housing makes the multi line laser insensitive to dust and splash water (protection class IP54). Thanks to its pendulum lock, the Bosch GLL 3-80 P Professional is also perfectly protected against impact when it is transported to the construction site. It remains fully functional when dropped from a height of one meter. The tool’s “Out-of-Level” function helps to achieve error-free working. If there is an unintentional incline of more than 4°, the Bosch GLL 3-80 P Professional Line Laser warns the user by means of an acoustic signal and a quickly flashing laser line. The user can fix the pendulum lock if inclined lines are required. Then he can use the tool to project laser lines at any desired inclination. The 3 simultaneously available laser lines ( 1 horizontal and 2 vertical 360° ) enable parallel work in a team with only one tool. Thanks to the very clearly visible laser lines, there is no need to repeatedly position the tool during leveling work in larger rooms. 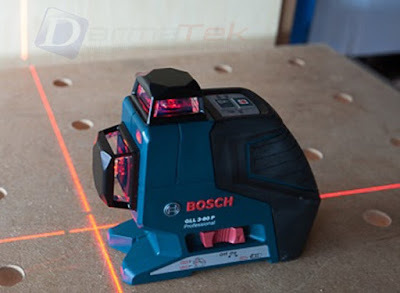 Moreover, the all-round availability of the three laser lines enables simultaneous work in a team with only one tool. The Bosch GLL 3-80P Professional Line Levels it self in less than four seconds. It is very accurate with a leveling accuracy of 0.2 millimeters per meter. There is a 5/8″ and a 1/4″ thread for working with a tripod. In addition to this, the magnetic base plate makes it easy to fix the tool on iron girders or rails. 4° in 4 sec, very precise (± 0.2 mm/m) and range of up to 80 m with receiver. Compact, easy-to-handle and extremely robust (IP 54). Saves you having to purchase several different tools, the individually switchable lines for the specific applications collectively cover the functions of a cross line laser and a point laser with only one tool. This tool even performs the indoor applications of a rotation laser.